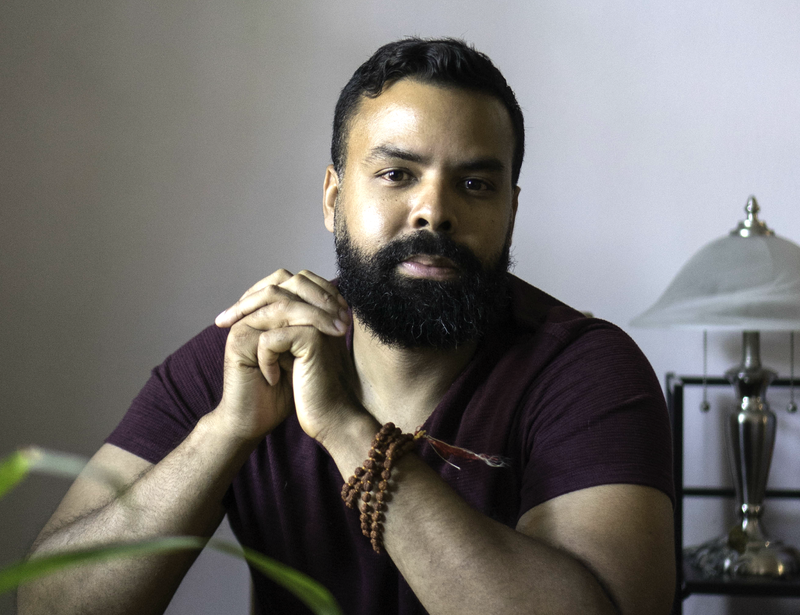 Daniel O'Brien's unpublished first children's book, The Carnival Prince, developed from drafts workshopped in his SCBWI writing group, and is inspired by his love for Caribbean folklore, Trinidad Carnival and the natural landscape of the islands. 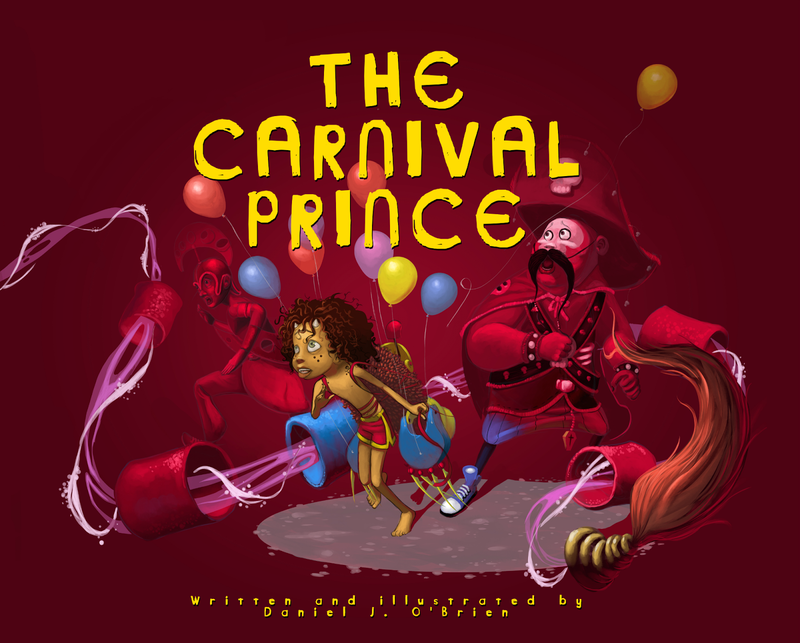 Set in Trinidad, the richly vibrant world of Carnival comes to life in The Carnival Prince, an illustrated short chapter book for readers ages 6 and older. To the Boy with the Stubby Antlers, the world outside his jungle home is intimidatingly full of strange change. The Boy would much rather spend his days with his friend, the Scarlet Ibis, exploring the bush and swimming with the manatees. Yet the scents, sounds, and sights of Carnival beckon him every year. Enter The Midnight Robber, a rapscallion who speaks with Trinidadian flare. Taunted annually by The Dragon, a menacing yet popular Carnival figure, The Midnight Robber plots his mischievous revenge. With the help of The Boy, they make a pact to trick The Dragon and scare him away so everyone can enjoy the Carnival without fear. 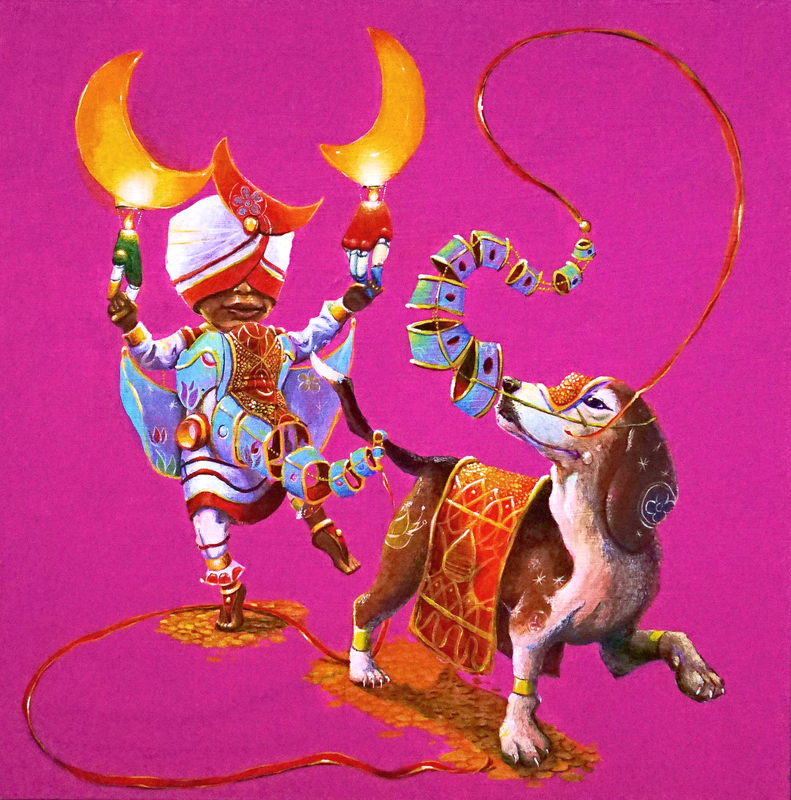 O'Brien channels his admiration of Trinbagonian mas designers Peter Minshall and Wayne Berkeley into lovingly rendered scenes of Trinidad Carnival, depicting traditional mas characters in his cartoonesque illustrative style. He describes the illustrations in the book as "a personal love letter" to famed Trinidadian landmarks including Maracas Beach, Nariva Swamp and St. James, aka "the city that never sleeps." Love is an underlying theme in the story. Animals like the Scarlet Ibis (The National Bird of Trinidad and Tobago), the West Indian Manatee and hummingbirds are depicted as playful, affectionate and devoted companions of the adventurous little prince. Also featured in the story are Papa Bois ("Father of the Woods") and Mama D'lo (from "Mother of the River"), who are the Carnival Prince's parents, and douens, mythological creatures from Trinidad and Tobago folklore believed to be the lost souls of children who have died without being baptized. The story humanizes these legendary folkloric characters by depicting them as a loving family. The illustration "For the Love of the Story (Too Young to Soca)" introduces the Boy with the Stubby Antlers. My inspiration came from my love for the old folklore of the Caribbean islands. Notice the Scarlet Ibis fleeing into the woods. I wanted this book to teach as well and inspire and entertain, so the introduction of the National Bird was my first attempt to do so. 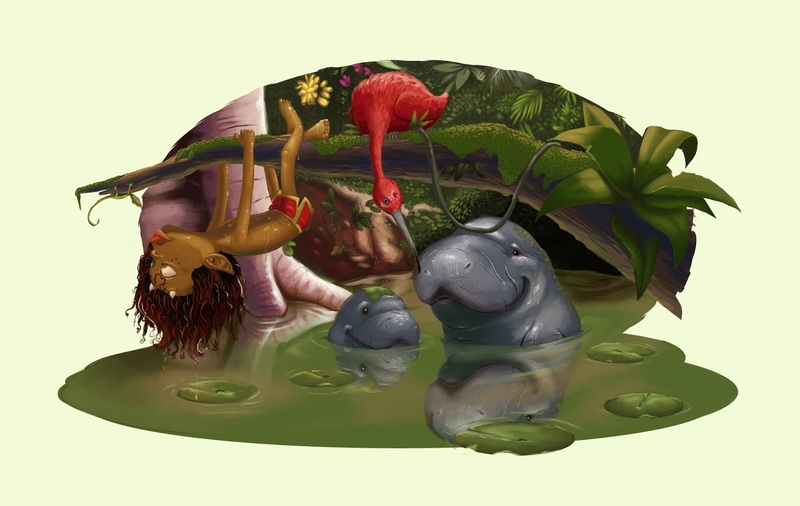 In the illustration "For the Love of Play," we see the Boy with the Stubby Antlers playing with the manatees in Nariva Swamp. These gentle creatures inspired folklore of their own; it has been said that they were once mistaken for mermaids. Caribbean children’s illustration helps me to connect to my culture and share it proudly with others. It provides an avenue in which to present stories people do not always get to experience, by using a voice that is not always heard. I am happy to contribute to the telling of our stories and would be honoured to be a part of the community helping children in the Caribbean and of Caribbean descent see themselves in the books they read. 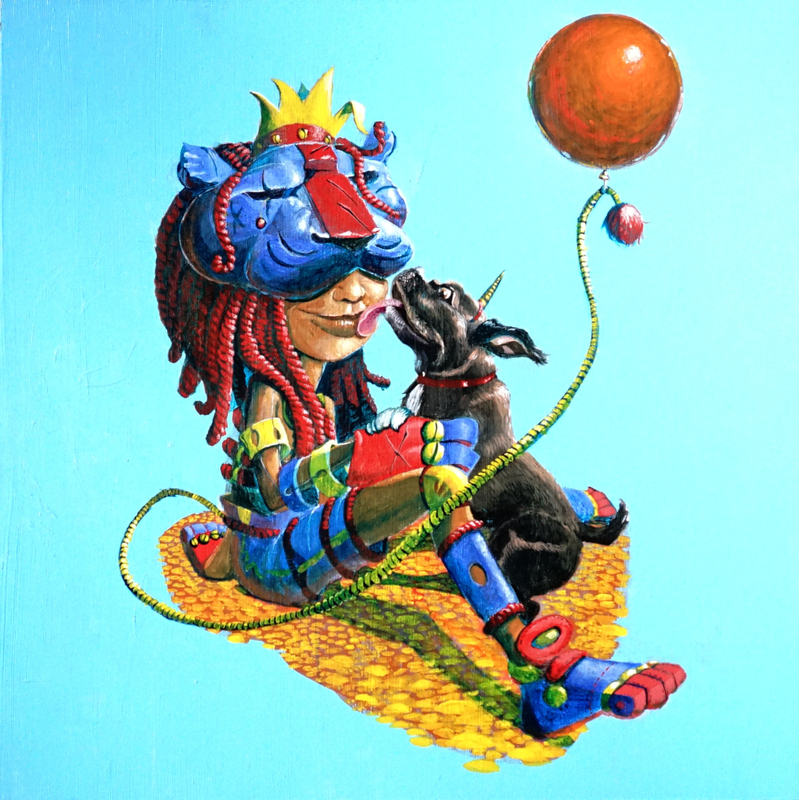 Daniel O’Brien is a Trinidadian-born illustrator currently residing in Queens, New York with Obie, his loyal and energetic dog. He holds a BFA in Illustration from The School of Visual Arts. 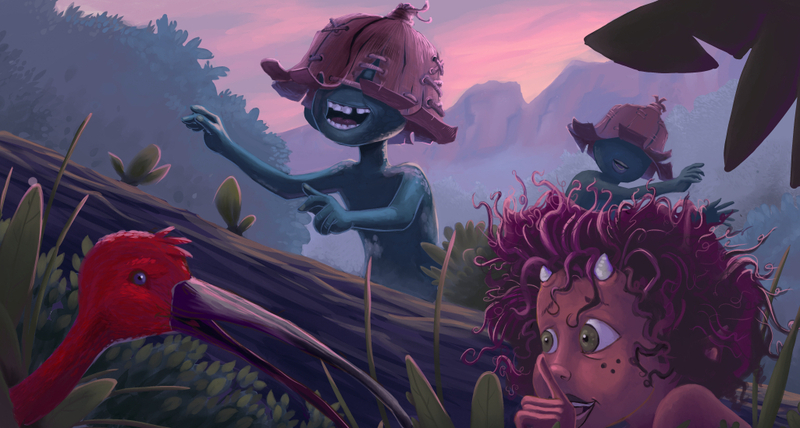 His training, coupled with his love of science, folklore and nature, inspires him to create otherworldly illustrations. His art has been shown in exhibits in Trinidad and New York, most recently in partnership with the Parsons Scholars Program. He is currently in the process of self-publishing his debut children's book, The Carnival Prince, which he both wrote and illustrated, and is excited as he looks forward to the next project.